Bali Hai necklace, named for the fictional island in the musical South Pacific, uses two stunning large silver beads. Just as the tropical island was reported to have twin volcanoes, the necklace has exotic twin focal points. Most of the beads that I originally used were purchased at shows and from suppliers who no longer carry them. I suggest Beadaholique as a source for beads that you may like to use as substitutes. 1. Cut the sterling silver wire in half. Slide a piece through each of your large silver beads, and create a wrapped loop on both ends. File any rough spots. 2. Cut your beading wire into a 17 inch and an 18 inch piece. Attach the 17 inch piece to one of the wrapped loops with a crimp bead. 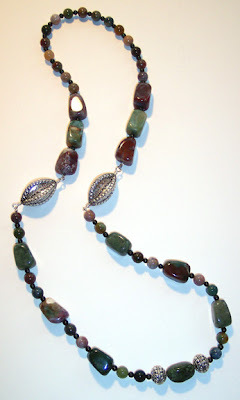 Bury the short end as you add the next few beads: String three large bloodstone nuggets, alternating with 4mm bloodstone rounds. After the last nugget, continue alternating the 4mm rounds with sixteen 8mm fancy jasper rounds. Add three more large nuggets at the other end, alternating with 4mm rounds, and attach that end to the other large silver bead, using a crimp bead. Pull the beading wire back through a few beads and clip the end close, burying the tip in the next bead hole. 3. Attach the 18 inch piece of beading wire to the free wrapped loop on one of the silver beads. String on an 8mm round and a 4mm round, twice. Add three large nuggets, with alternating 4mm and 8mm segments between them (4mm, 8mm, 4mm, 8mm, 4mm). After the third nugget, add another segment of alternating 4mm and 8mm beads. Follow with a 10mm sterling silver bead, a nugget, and the other 10mm silver round. 4. To string the second half of this strand, reverse the pattern from the first half, starting with an alternating segment of 4mm and 8mm rounds, adding three more large nuggets with the alternating 4mm and 8mm segments between them. End by stringing on a 4mm round and an 8mm round, twice. 5. Add a crimp bead and go through the remaining wrapped loop. Pull the wire back down through a few beads, tighten the crimp and clip the wire end close, burying the tip in the next bead hole. As regards FTC disclosure guidelines: I have received Acculon free of charge from Cable Strand Corp in order to create a project free of charge for you. I have not been paid for my endorsement as it pertains to the products received.